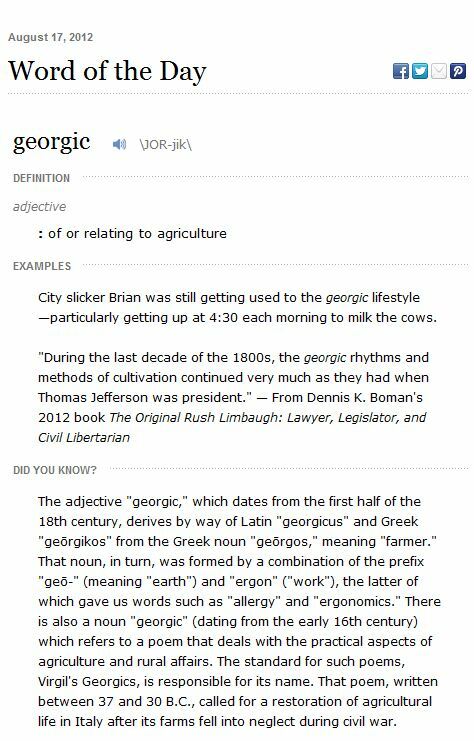 “Georgic,” today’s Merriam-Webster Word of the Day, is the root of my surname. Those who know me well would probably see humor in this, especially since I have never lived on a farm, have never been known for a particularly green thumb, and consider successfully growing jalapeño peppers and basil on the roof deck to be a major agricultural achievement. Nonetheless, there must be something deep inside me that longs for connection with those earthy roots. I remember fondly stories of my grandmother growing up on a farm in Ireland. Along with her, some of the people closest to me in life have been great gardeners. This includes, oddly enough, every guy I’d put in the category of partner / boyfriend / significant love interest. Through the latter I’ve had the chance to get my hands dirtier than I would naturally tend to do. There is something very primal and satisfying about digging in the dirt, about watching a seed planted in the darkness and silence of the earth emerge, in time, into the the light of day. The earth’s cycles are the cycles of our souls: Life, Death, Rebirth to New Life. This entry was posted in Reflections and tagged earth, farmer, georgic, surname. Bookmark the permalink.